Like others, Jesus himself appreciated being touched. In chapter 7 of Luke we have the story that gave scandal: Jesus allowed himself to be touched and anointed by a woman who was a known sinner. People experienced a difference in the way Jesus taught. He did not speak down to them. He did not lay burdens on them. He practiced what he preached. It is easy to imagine the people thinking, ‘Yes, this man knows our situation. He speaks as one of us.’ Jesus knew what it was like to be poor and merciful, knew the struggle to be a peacemaker and to be pure in heart and to keep on trusting God when times were tough. 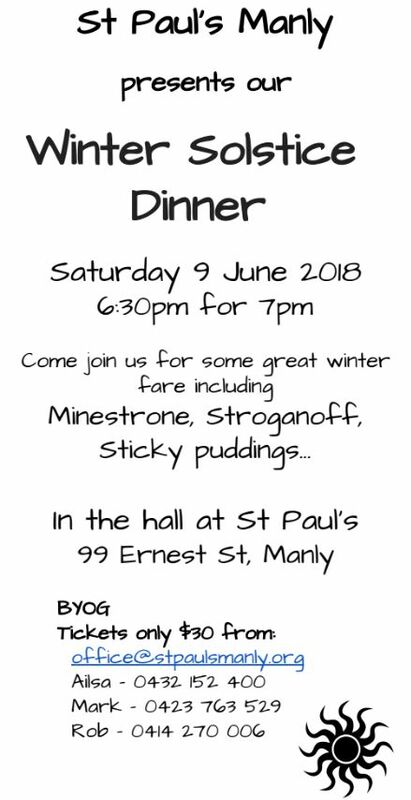 A message of thanks from all at St Paul’s, Manly. As we come to the end of Fr David’s tenure as Associate Priest at St Paul’s we would like to offer a few words of thanks to David and Rhonda for their spiritual guidance, love, support and good humour during their time with us. They have both fitted in to our church family, despite our occasionally somewhat peculiar ways with barely a raise of the eyebrows! We like to think of ourselves as a warm, welcoming and friendly congregation and trust David and Rhonda have found us so. We often hear the term, ”We live in uncertain times”. These words are certainly true for us today as we journey through this interegnum. With David’s steadying hand on the tiller we have sailed through this part of the journey and been given the strength to carry on. What lies ahead only will God know. We just pray that in this small corner of his vineyard all will be well. So as David and Rhonda approach their last Sunday with us as our Priest ‘team’, I would like to offer on behalf of the Wardens, Parish Council and congregation a hearty and heartfelt farewell. May God bless you both as you begin a new chapter in your lives bringing you joy, contentment and good health. We will hold you in our hearts and remember you with fondness. The Wardens, Parish Council and Congregation of St Paul’s, Manly. Come join us for an evening of good food and great company! It is interesting that Jesus links repentance with believing the Good News. We may question whether Christianity has been consistent in linking the two, and whether we have done so in our own thought and practice. to get to God. On the other hand, there is the danger of making it all too cosy and easy if we only focus on the Good News. Jesus urges us to a balanced approach. Repent: turn away from pride, selfishness, closed minds that have everything boxed up, attitudes that close us off from people. And the purpose of this repentance? That we might believe and proclaim the Good News of God’s love, God’s presence, and God’s forgiveness. None of us can say we have no need of repentance. None of us can say that our present belief in God’s presence with us is sufficient.